Join Connie Live in Concert along with the great performing artists of the freestyle era. Party like it’s 1989. Saturday, June 2nd., 2018 7:30 pm. Alamodome Illusions Theatre, San Antonio, Texas. 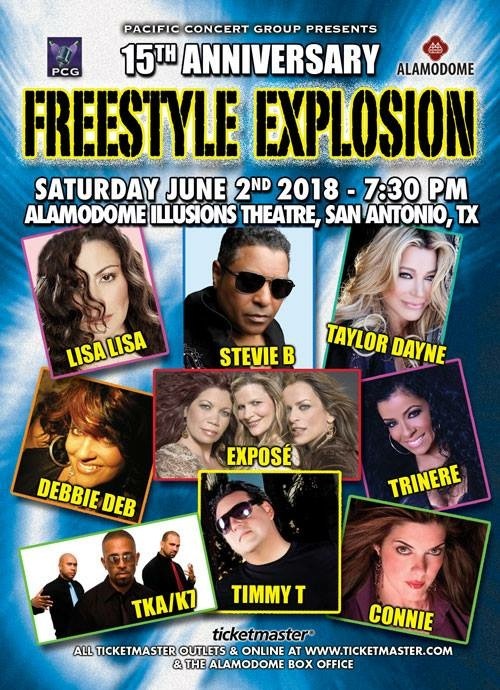 Featuring: Connie, Lisa Lisa, Stevie B, Taylor Dayne, Debbie Deb, Expose, Trinere, TKA/K7, Timmy T.
Freestyle music developed in the early 1980s, primarily in the Latin communities of Upper Manhattan and The Bronx and the Italian-American communities in Brooklyn, The Bronx, and other boroughs of New York City, later spreading throughout New York’s five boroughs and into New Jersey. It initially was a fusion of synthetic instrumentation and syncopated percussion of 1980s electro, as favored by fans of breakdancing. Sampling, as found in synth-pop music and hip-hop, was incorporated. Key influences include Afrika Bambaataa & Soul Sonic Force’s “Planet Rock” (1982) and Shannon’s “Let the Music Play” (1983), the latter was a top-ten Billboard Hot 100 hit. By 1987, freestyle began getting more airplay on American pop radio stations. Songs such as “Come Go with Me” by Exposé, “Show Me” by The Cover Girls, “Fascinated” by Company B, “Silent Morning” by Noel and “Catch Me (I’m Falling)” by Pretty Poison, brought freestyle into the mainstream. House music, based partly on disco rhythms, was by 1992 challenging the relatively upbeat, syncopated freestyle sound.